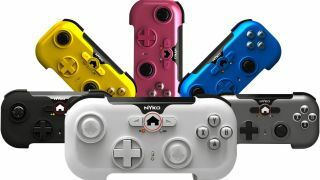 Leading peripheral company, Nyko, announced at E3 2012 that they are releasing an Android Gamepad that will connect to a user's Android mobile device via Bluetooth. The gamepad, named the PlayPad and PlayPad Pro, are two new Android-based controllers that work and function just like a standard PlayStation 3 or Xbox 360 controller. The gamepads use the latest Android supported driver protocol and would work on any Tegra-based Android mobile device, smartphone or tablet. Button placements on both the PlayPad and PlayPad pro are identical to that of the leading HD gaming console controllers, giving gamers a familiar feel when using it. The PlayPad Pro is shaped to look and feel like a standard Xbox 360 controller, while the PlayPad is more streamlined and compact, for the gamer on the go. Along with the PlayPad, Nyko has a collapsible stand and case to store the controller. As for the price point, no announcements have been made. However, Nyko is looking to release these this holiday season. Along with the gamepads, Nyko showcased two new products made for portable game systems. The Power Grip for the PlayStation Vita and the Power Grip Pro for the Nintendo 3DS. The Power Grip for the PS Vita provides additional battery pack, which prolongs the battery life up to about three times the amount. In addition, it gives the user a solid grip while handling the device. It will retail for $29.99 and releases in August. The Power rip Pro for the Nintendo 3DS adds a battery pack, extending the life of the device up to three times as well. It also adds an extra analog stick that gives the 3DS dual stick functionality. No price point as of yet, but it is set to ship in October. Lastly, Nyko decided to throw it's hat into the Arcade Fighting Stick arena. Nyko calls it's first professional fighting stick, The Free Fighter. This arcade stick is designed for the PlayStation 3 and it has customization in mind. It comes with an expandable base for lap comfort, but also detaches if you choose not to use it. The Free Fighter also breaks into two parts and it's swappable on either side, making it the first ambidextrous Arcade Fighting Joystick. The user will be able to flip the joystick and place it on either side of the buttons. Customizing functionality is also added to the Free Fighter, via four macro buttons and two rapid fire buttons. You can also set a delay for the rapid-fire function as well. The Free Fighter will be available for retail in September and will cost $179.99.